Over time, I may try to woo you with talk of coffee grind particle distribution and total dissolved solids (TDS). I’ll warily tiptoe into debates about brew methods or maybe tunnel down the rabbit hole of coffee varietals. It might even be fun to explore the groundbreaking research on specialized coffee fermentation—who doesn’t love talking yeast and bacteria? But no matter what, every detail about the lifecycle of coffee, from seed to cup, starts and ends with how that hot (or cold) brown bean soup tastes. That’s the quest. Which fragrances wake your olfactory senses as the cup approaches? What spice or fruit or nut notes jump onto your taste buds? How intense are those flavors? Can you feel the body of the liquid? How does it finish? How does it pair with kale? Don’t care? Then why are you paying more than $3 or $4 for a cup? 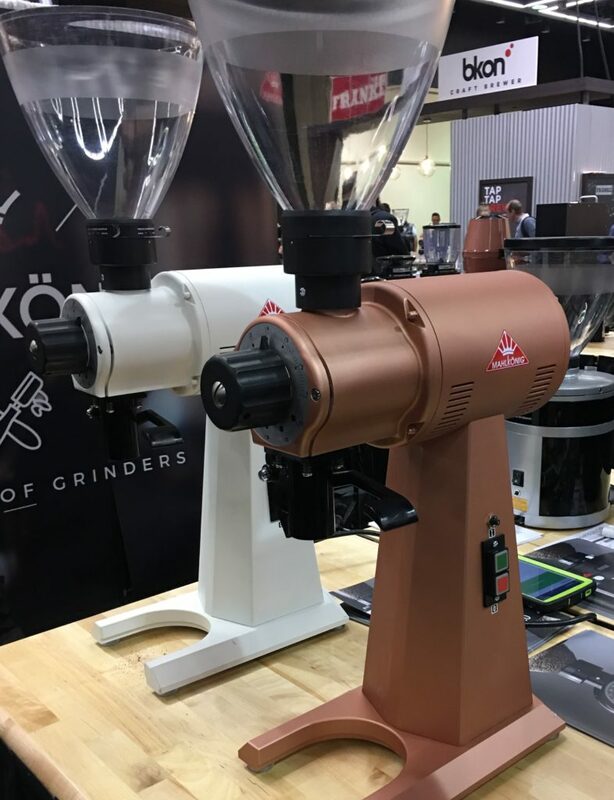 During the Specialty Coffee Expo in Seattle last weekend, Gary Horne, president and CEO of Mahlkonig USA, one of the biggest manufacturers of commercial coffee grinders, regaled me with the secret to his company’s products: the attention to quality parts in the right places unlocks the coffee’s flavors (his words, not mine). 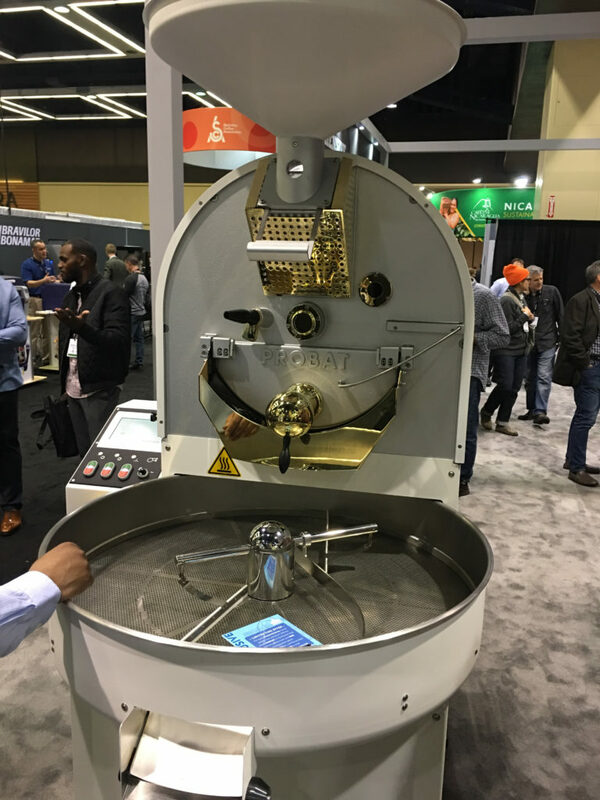 And wherever I went, whether I was talking with Clever or Bodun about brewers, Probat or Diedrich about roasters, or delegations from Ethiopia or Costa Rica or Panama or Brazil or even China about coffee beans, it always came back to taste. After every discussion or demonstration, I was offered a taste—a taste of black coffee, with no cream or sugar in sight. Coffee tasting, as it happens, is its own specialty. In that way, it’s no different than the study of wine or beer or cheese. The Specialty Coffee Association (SCA) holds courses and gives certificates in sensory skills. Although I’m trying to ratchet up my coffee expertise in many areas, developing and refining my ability to taste the complexity of coffee is my primary and urgent goal. 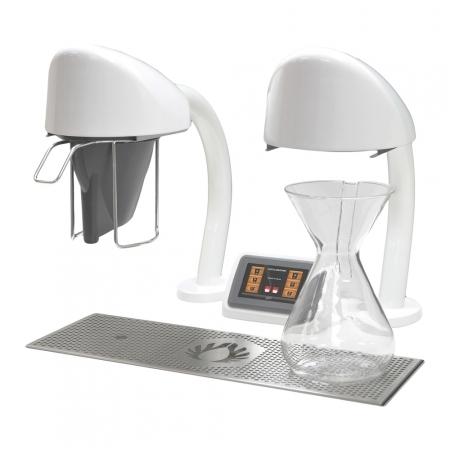 Without that, understanding the intricacies of roasting or coffee production, for example, would hardly matter. Taste is only what we perceive in our mouth as the five basic taste sensations; bitter, sweet, sour, salty and umami (savory). Whereas aroma can be perceived either as orthonasal, through our nasal cavity, or retronasal, through our oral cavity and up to the olfactory epithelium. Word Coffee Research also published a “sensory lexicon,” developed at the Sensory Analysis Center at Kansas State University (no, I didn’t make that up), in order to establish a common language for every aspect of coffee development and research, to foster an understanding the relationship between flavor and factors like coffee genetics, environment, climate, irrigation, fertilizer, fermentation and storage. And that’s just the short list. The lexicon is like a dictionary of coffee’s sensory attributes—it is composed of every expression of flavor and aroma experts could identify in coffee, 110 in total, ranging from “blueberry” to “petroleum-like,” based on an evaluation of over 105 coffees from 13 countries. 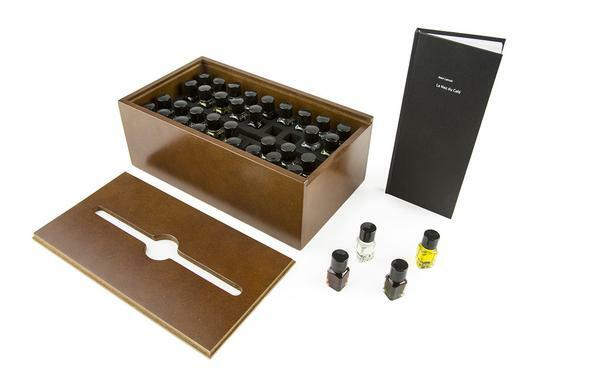 There are also sensory toolkits for coffee, just as there are for wine. These, like sensory training classes, are expensive . . . although perhaps they can double as cologne. It is possible to train your brain to taste most flavor attributes. Most specialty coffee includes tasting notes, often on the packaging. If not, ask your barista. Some of the magic to unlocking those tasting notes, however, depends on how closely you hue to the specific grinding and brewing methods that elicited those tasting notes. For example, I recently visited a local cafe and splurged on a Panamanian Geisha varietal (La Milagrosa Geisha). Geisha is a somewhat rare (or difficult to grow) and high-quality varietal, so you’ll pay top dollar for it, but because I’ve been practicing some tasting techniques, I wanted to see if I’d made progress. Its grape notes and melon gave my mouth a flavor wallop I’d never experienced before, so I asked the barista for some brewing guidelines if I were to purchase a bag. The barista used a V70 brewing method (taking advantage of a sophisticated commercial brewer from well-known manufacturer Wilbur Curtis, seen pictured above), not something I had at my disposal, but my Chemex is a rough approximation for the cone shape of the V70. The shop’s method, or recipe, involves anywhere from six to eight short pulses of water (most of them about 55ml every 20 seconds). All of this was detailed with great specificity in a spreadsheet-like app/console (also pictured above) that comes with the brewer, and there was a little chart recorded for each coffee the shop brews by hand. Most specialty coffee shops create specific recipes after testing each coffee using a variety of grind and brewing methods to extract the best flavor. Detailing it also ensures that every time I go into one of this company’s shops, I get the same experience. Tasting notes are a bit of a cheat. Developing your own idea of flavor is more important, and you can do this by simply remembering things you’ve eaten every day. Eat an apple and tell yourself to savor and remember the taste. Do this even at the apple variety level. Do it with nuts, with citrus, with floral aromas and tastes. Create a memory bank of flavors. See if you can craft a distinction between a Bartlett pear and an Asian pear, a honeydew melon and a cantaloupe. I’m a little extreme, but I have also been brewing two cups at a time. Sometimes it’s two distinct coffees that I know will have very different flavor attributes. Sometimes it’s the same coffee brewed different ways, or even with slightly different grinds. Often, I’m simply trying to dial in a bag of coffee beans, but by doing this I am also noticing how each small change impacts flavor. I’m also more willing to let my coffees cool, because the attributes change. I find I can actually pick out more flavors in a lukewarm cup than a hot one. Every once in a while, just to regain some confidence, I’ll go back to a coffee that has been dry-processed—that is, dried in the sun by the producer with the fruit on the bean. Coffee processed this way tends to push berry flavors to the front. You can smell the blueberry of a natural-processed Ethiopian coffee, let alone taste it. But sometimes these coffees don’t taste as clean or as balanced as a washed-processed coffee. 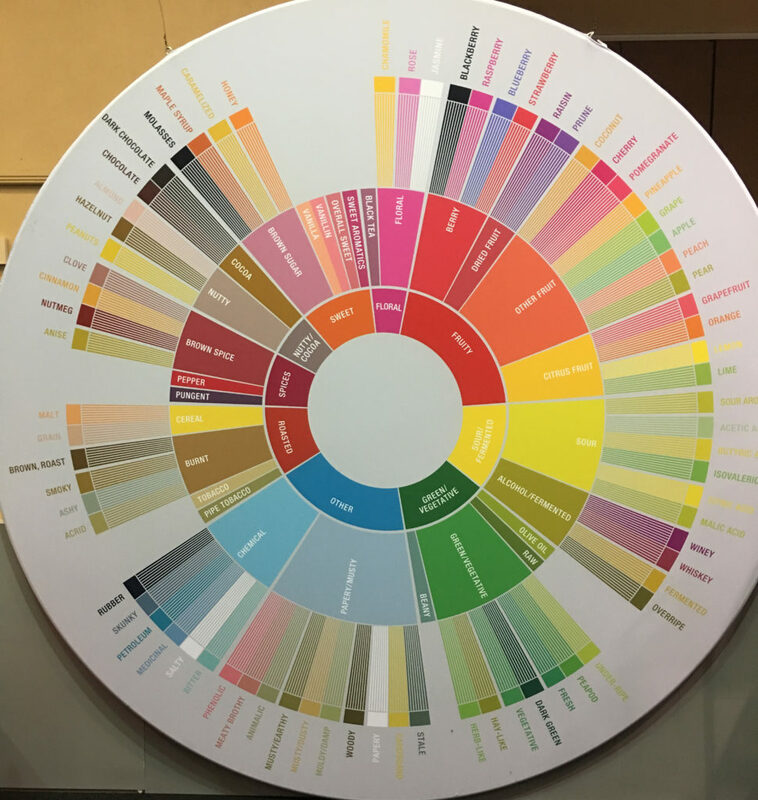 The SCA also worked with World Coffee Research to create the flavor wheel (pictured above). The wheel is a phenomenal tool, because it maps words to your memory bank, unlocking those flavors as you taste, especially when you can’t quite put your finger on the flavor. I’ve found it so helpful that I bought a poster-sized version. It’ll go right next to my Justin Bieber poster. 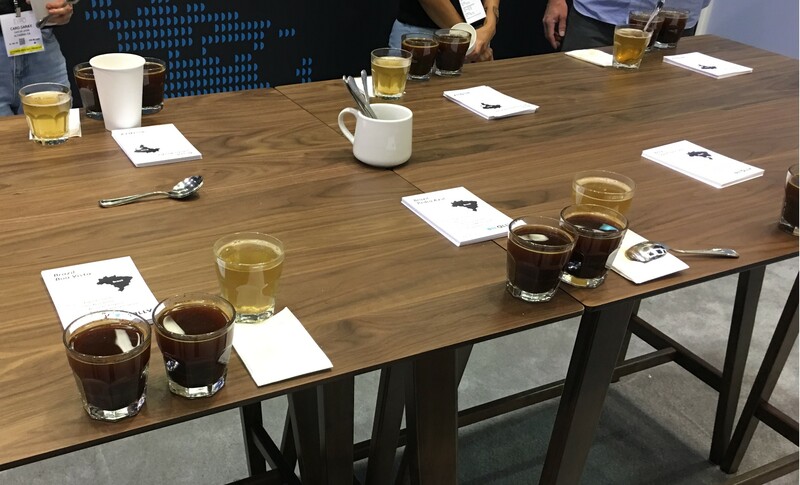 One of the ways in which professionals taste new coffees is via a “cupping.” I stumbled into one such exercise at the Ally booth at Expo and was encouraged to jump in. Before doing so, I sidled up to someone who looked like he’d done it before to ask how it worked. First, the coffee is ground (medium grind) and the tasters smell those dry grounds for the fragrance. Then the grounds sit in water, steeping, for four minutes. The tasters then use a special tasting spoon (looks like a soup spoon, but shaped slightly different) to break the crust of the grinds and uncover the aroma of the brewed coffee. The grounds are then sifted from the top of the coffee, which sits for several minutes (eight in our case) to cool a bit. This is when the fun really starts. You go around to each cup pair with your spoon, which you dip into the coffee and then violently slurp. You then spit the contents into a paper cup that you carry with you during the tasting. This violent slurp lets you extract body, acidity and flavor, because it causes the coffee to reach all areas of your tongue. You spit so that you don’t become too overwhelmed by all of that caffeine. You can see this in the very short video clip below. Cupping In Action from Fritz Nelson on Vimeo. 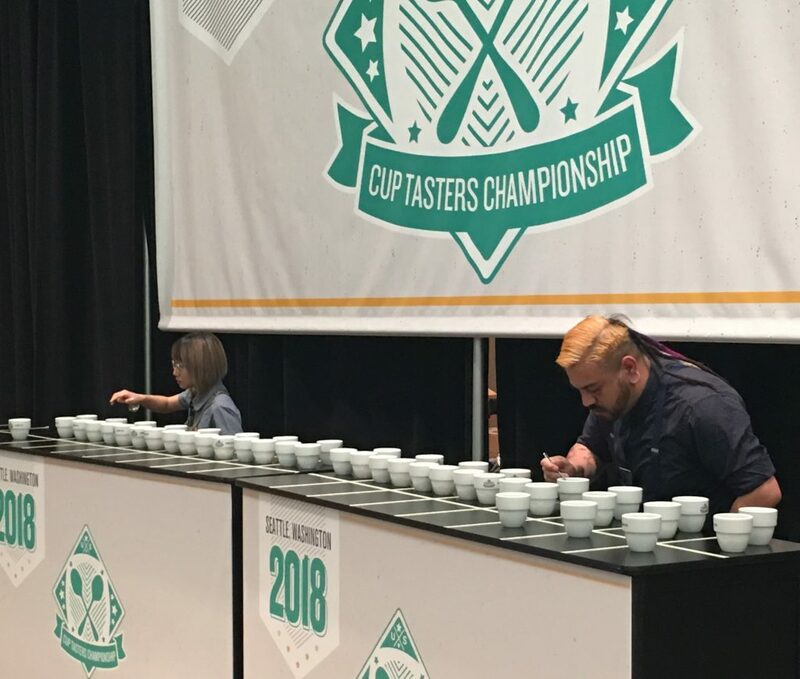 There’s actually a Cup Tasters Championship, which I also briefly watched at Expo—there’s only so much slurping I can take. Here, the contestants get eight sets of coffee trio samples. Within each trio, two of them are the same. The contestants violently slurp each sample and push the one that’s different away from the other two (called triangulation). . . and then go down the line for all eight sets. Scoring is based first on how many the contestant gets correct. 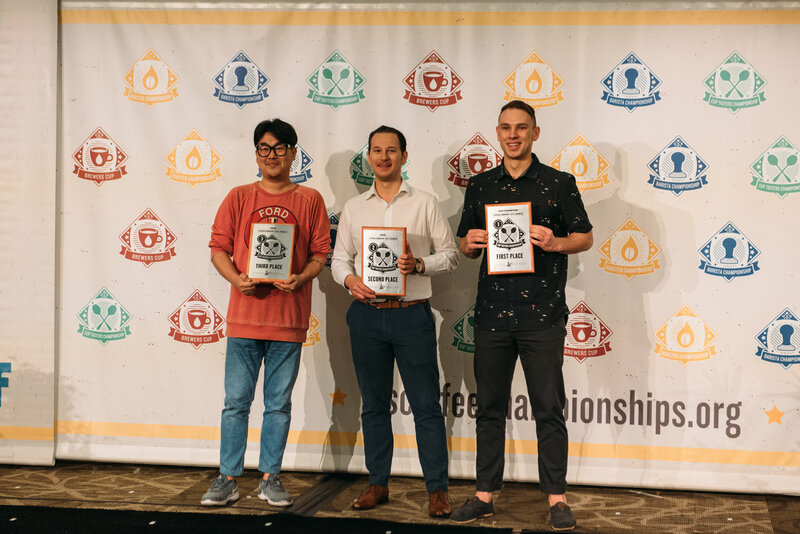 As a tiebreaker, the fastest of those contestants wins—Ken Selby of Visions Espresso in Seattle was the Expo’s winner. All in the name of a better cup.